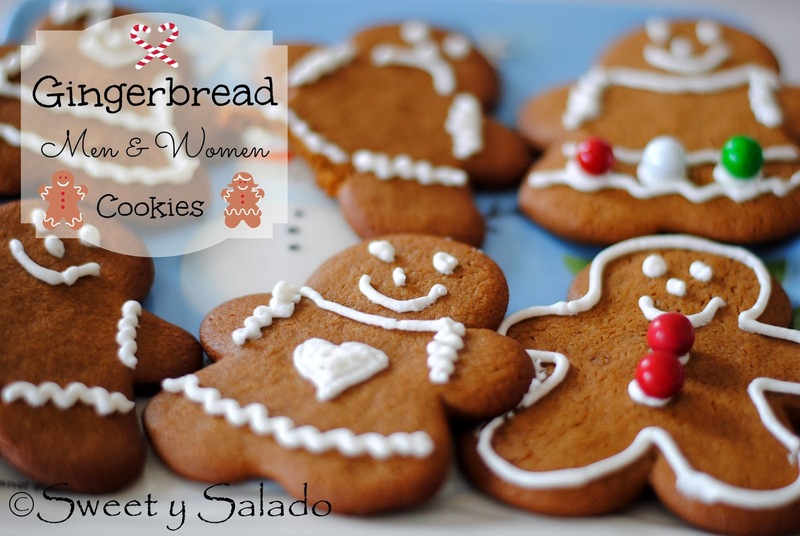 Since I have been living in the US for so many years, every December I usually make not only traditional Colombian food to celebrate Christmas, but I also love making desserts and meals that are made in this country during the holiday season, like for example, gingerbread men cookies. The mere smell of molasses and cinnamon makes me feel that Christmas has officially begun, I play traditional Christmas carols and dedicate a whole afternoon to make them. And many of you many not know this, but they taste exactly like the cuca cookies that are sold in Colombia, simply delicious. The part I enjoy the most is decorating them. I just think they’re so cute and beautiful with the different faces you can make, plus, I love adding little chocolate pearls in their clothing to make them more “fashion”, especially the gingerbread women. Traditionally, royal icing is used for decoring these cookies but a while back I decided to do it with buttercream and I loved it because it firms up well and they taste great. 1. Mix the flour, ginger, cinnamon, nutmeg, cloves, baking soda and salt in a large bowl. Set aside. 2. In another large mixing bowl beat butter and sugar until they’re light and fluffy. 3. Add the molasses and the egg and beat until they’re well mixed. 4. Add half of the amount of the flour mixture and beat until it is well incorporated. Then, add the remaining flour mixture and beat again until it is well incorporated. The dough is ready when it is soft and firm. 5. Place the dough on a flat floured surface and form a ball. Cut the ball in half. Shape both halves into flat discs and wrap them with plastic wrap. Refrigerate the dough for at least 1-2 hours or until it firms up. 6. Preheat your oven at 350ºF (180ºC) and cover several cookie sheets with parchment paper. 7. Place the cold dough on a flat floured surface and roll it out with a rolling pin until it is about ¼ inch (.64 cm) thick. 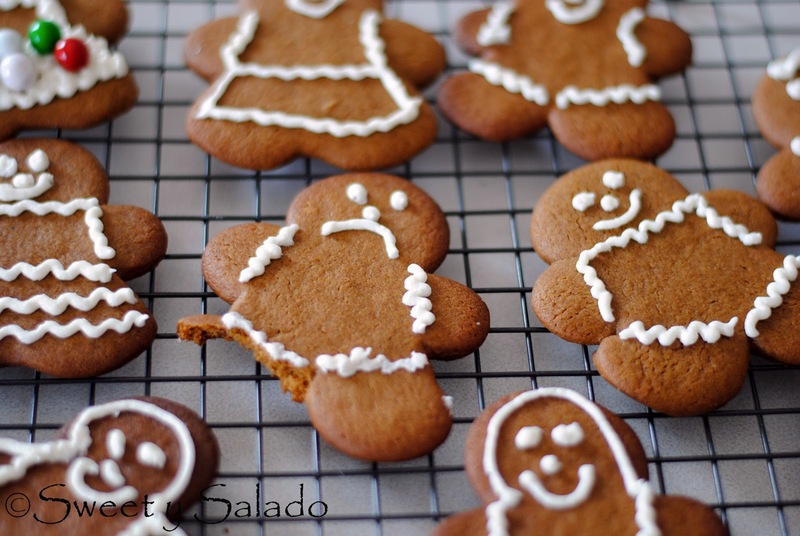 gingerbread men and women cookie cutters, lift them off the surface with a spatula and place them on the cookie sheets about 1 inch (2.54 cm) apart. Keep doing this until you run out of dough. 9. Bake for approximately 8 -10 minutes or until the edges begin to brown. **Note: If you want softer cookies, bake them for a little less time. 10. Let the cookies cool on the baking sheets for about 1-2 minutes and then place them on racks to let them cool completely. 1. Beat the butter with an electric mixer in a large bowl at high speed until fluffy, about 2-3 minutes. and beat at high speed for another 2-3 minutes. 3. Add 1 tbsp of milk and beat at high speed for about 2-3 minutes. 4. Add the vanilla and mix at high speed for 1-2 minutes. Add another tbsp of milk if the buttercream is too thick and beat again until smooth. 5. Place the buttercream in a pastry bag fitted with a small round tip (ex. Wilton’s #1 round tip) and decorate the cookies as desired. You can also place the buttercream in a small plastic bag and cut off one of the ends to decorate the cookies. **Note: This cookie dough can be stored in the freezer for up to 6 weeks. Just place it in the refrigerator overnight to thaw it.